Originally designed with the co-operation of palaeontologists from the American Museum of Natural History, the feathered dinosaur tube made by Safari Ltd contains twelve, hand-painted dinosaur models. 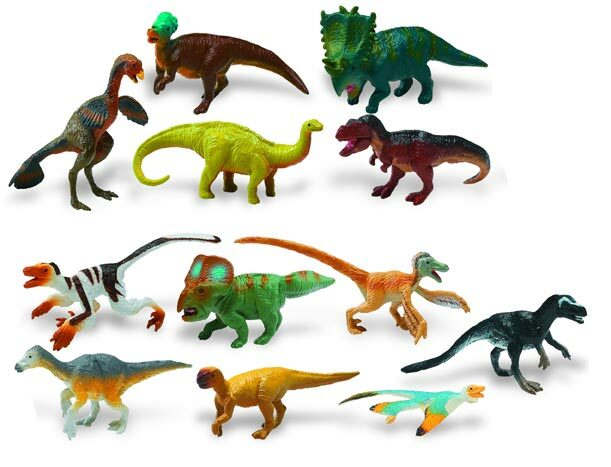 Of the twelve models in this set, only six are replicas with feathers, the remainder include the likes of a T. rex figure and a model of the Sauropod, the long-necked dinosaur known as Apatosaurus. The feathered dinosaurs in the set are Microraptor, an ancestor of the Tyrannosaurs known as Dilong, Sinornithosaurus, Velociraptor, Beipiaosaurus and Caudipteryx. The Microraptor model has recently been re-painted . The gaudy colours of the original model in the first sets to become available, have been toned down replaced by steel blue for the body with subtle greens, yellows and black for the feathered wings. The new colour scheme is probably better camouflage for a flying dinosaur that may have spent a considerable amount of its time in the forest canopy. Feathered dinosaurs toob model set. The non-feathered dinosaurs in this set are Psittacosaurus, Chasmosaurus, Pachycephalosaurus and Protoceratops as well as the aforementioned T. rex and Apatosaurus replicas. It is interesting to note the inclusion of a Protoceratops and a Velociraptor model together. The Protoceratops was a plant-eating dinosaur with the predatory Velociraptor sharing its habitat. This combination is very appropriate (putting a model of Protoceratops and Velociraptor in the same set), especially when you consider the scientific evidence such as that published in 2010 suggesting that the carnivorous Velociraptor may have scavenged the carcases of the plant-eating Protoceratops as well as the famous Velociraptor fighting a Protoceratops fossil discovered by a joint Polish and Mongolian expedition to the Gobi desert in the 1970s. Intriguingly, a contemporary of both Velociraptor and Protoceratops is depicted in the set – Psittacosaurus. Since the models making up this set were first produced; new fossil evidence concerning Psittacosaurus has been discovered. Although this dinosaur is depicted as non-feathered in this particular model series, there is considerable fossil evidence to indicate that this small Ornithischian was covered in downy feathers, or at least it had long feather-like quills protruding from the tail. The dinosaur replicas are approximately eight centimetres long. Although, the models are not to scale, they make super additions to any model scenes that are being created. Especially the likes of the Dilong, Caudipteryx and Microraptor replicas when used in conjunction with some of the Carnegie Dinosaur Collectibles models also made by Safari Ltd.
As this set contains, 12 models, it lends itself to creative play. So this set is likely to prove popular with children as well as with collectors. Supplied with its own handy storage pack those thoughtful sculptors at Safari Ltd have even ensured that each model has the name of the dinosaur it represents carefully inscribed on its underside – very helpful for those collectors wishing to identify their models. It is good to see a set that includes some feathered dinosaurs within the already impressive Safari Toobs range.